RICHMOND, Va. – Jody Rogers doesn’t have to be here, sloughing through paperwork and compliance meetings with her assistants, Kyleigh Gerlach and Chad Gatzlaff. She didn’t have to spend the spring zigzagging the country, feet pounding the pavement of an unending recruiting trail. 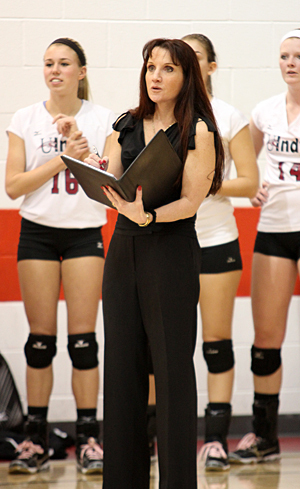 Her University of Indianapolis program stood among the Division II volleyball elite. The Greyhounds were coming off a dream season, a 31-win campaign that included the school’s first Final Four appearance. Her next two recruiting classes were already locked in. The incoming class, she says, was her best ever. So what is she doing in Richmond on a Monday afternoon, combing over recruiting boards and evaluating the state of the VCU program? At UIndy, she was an institution of 400-plus wins and 16 years of success. Last year she was two wins away from a national title. Now she’s at square one. VCU isn’t a rebuilding project by any means – it was 25-6 last year – but the Rams have also won one conference title in 28 years. Rogers is used to, and demands, more. Decanting Rogers’ motivations for leaving Indianapolis and jumping at the chance to take over the VCU program probably requires a walk down the streets of her hometown of Newton, Mass. Rogers and her sister Wendy, 13 months her senior, grew up in a three-story (three-decka, by her parlance) house in Newton, a charming Boston suburb on the city’s western outskirts. Although Newton is relatively affluent, Rogers and her family were anything but well off. They lived on the first floor of a house owned by their grandmother, who took up shop on the second story. The third floor was rented to tenants. Jody Rogers’ mother, Linda, was a single parent and worked two jobs to keep the family in Newton, moonlighting as a waitress from her job at Metropolitan Life. Although Linda wasn’t athletic, she poured her two girls into every imaginable activity, from dance to basketball to volleyball and beyond. When Newton didn’t offer a girls softball league, Wendy and Jody played on a boys baseball team instead. The sandlots and courts made them tough and competitive. Wendy and Jody’s sibling rivalry helped fuel their success. Linda’s work schedule made it a challenge for her to attend many of the girls’ sporting events, and family friends often helped shuttle them to and from games and practices. Although she couldn’t always offer support from the stands, she embedded in the girls’ souls an ironclad self-reliance and an emphasis on education. Rogers led UIndy to 406 wins in 16 seasons, as well as a Final Four appearance in 2012. “It was a great environment for us,” Jody says. “Even if she wasn’t there physically, she always pushed us to be better. She gave us love and support and instilled in us a work ethic and a respect of others. Education was huge for her. It was very important that we get our college degrees. Linda’s lessons served her daughters well. Wendy and Jody both became multi-sport standouts. Wendy, like the rest of Boston in the 80s, idolized Larry Bird and enshrined the Celtics’ great on her bedroom walls. Wendy grew into an all-state basketball star and later attended Eastern Connecticut State, a Division III school about two hours southwest of Newton, where she captained two Final Four teams and was named an All-American. Rogers offset her lack of size by improving her vertical leap and refining her all-around skills. She eventually led Miami Dade Junior College to a national championship in 1989. Afterwards, she followed her sister’s lead and starred at Eastern Connecticut. Wendy has since been inducted into the Eastern Connecticut Hall of Fame, while Newton North High School bestowed a similar honor on Jody last year. Jody Rogers is an upbeat, fast-talking, straight-shooting New Englander with an accent so inherently Boston she makes Will Hunting sound like Anderson Cooper. Even after 16 years in the Midwest, that distinct New England brogue never went away. Nor did her sharp Newton edge, forged by years of competition. It’s steered her coaching career. She’s always up for a challenge. It’s why, after stints as an assistant coach at Springfield College (Mass.) and her alma mater, Rogers was willing to become the boys varsity volleyball coach at Waltham (Mass.) High School in 1997. Even if Rogers took that same job today, she’d still be considered a pioneer. It’s why she took a flier on UIndy in 1997. Rogers didn’t believe she stood much of a chance of getting the job, but faxed in her resume anyway. They invited her to Indianapolis for an interview, and the athletic director offered her job before the day was over. It’s why Rogers was able to take over a Greyhounds’ program that had never been particularly relevant, one which had suffered through eight losing seasons in the previous 10 years and was coming off a 7-26 debacle, and whipped it into a winner in three years. Before Rogers arrived, UIndy had four coaches in five years. She stayed for 16. Rogers guided the Greyhounds to the 20-win plateau by Year Three, but she didn’t really consider it a success. Rogers wasn’t happy just beating ordinary teams. She wanted to be challenged and then rise up to meet that challenge. And succeed they did. Rogers and UIndy kept winning and beating the elite until they were the elite. Rogers led the Greyhounds to their first NCAA appearance in 2003, then led them back six more times from 2007-2012. In 2009, UIndy finished 38-2 and ranked sixth in the country. Rogers was named AVCA Division II National Coach of the Year. In 2012, she steered the Greyhounds to another 30-win campaign and a regional championship. In Rogers’ last four seasons, UIndy finished the year ranked sixth, 15th, 15th and 12th respectively. UIndy’s reputation as a national powerhouse practically rumbled into recruits’ living rooms before Rogers could get to the front porch. A national championship had become a reasonable, if not required, goal for the program. With a no-nonsense approach, Rogers hopes to establish a winning tradition similar to that of her UIndy tenure. But after 16 years and 406 victories, after six straight NCAA bids, after two National Coach of the Year awards, Rogers walked away to take the reigns at VCU. Success was by no means easy, but it had become commonplace, the blueprint understood, rehearsed and repeated. Rogers could’ve pushed ahead like that for years to come, hung scores of banners, sized championship rings. Instead, she’s ironing out the pronunciations of her own player’s names, players he didn’t know six months ago. Like the people who told her she couldn’t play baseball with the boys or the people that told her she was too short to be any good at volleyball or the people that thought she couldn’t win at UIndy, she was ready to prove she could succeed at college volleyball’s highest level. “I knew that I’d have to leave something great [at UIndy], but I wanted another challenge, and VCU was going to be my move to make that challenge, Rogers said. Behind Rogers’ desk, on a shelf in her neatly arranged Broad Street office, sits the 2005 Colonial Athletic Association Championship trophy, a reward for the Rams’ first conference tournament title since the Ronald Reagan administration and a reminder of the school’s only NCAA Tournament bid. 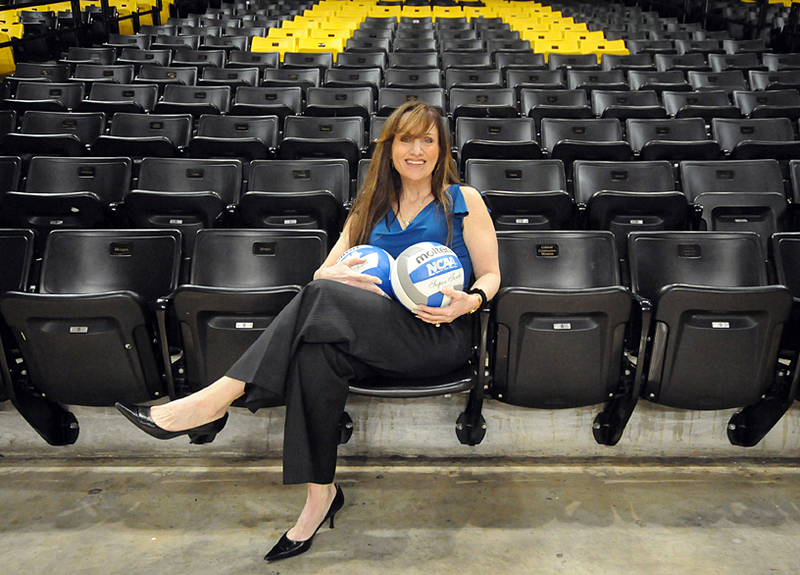 Although there has been a dearth of championships at VCU, Rogers believes she has the roadmap to national prominence. It’s a familiar road, one she walked on the sandlot, then in high school, then in junior college, and onto Division III and Division II. The only frontier unconquered, in Rogers’ mind, is Division I.
Rogers is confident in victory, but won’t promise and easy path. Challenge made her hungry, made her tough as a Nor’easter. “Great things can be accomplished at VCU,” she declares. I’m excited to see what the future holds. Nothing good is ever easy, and you’re going to have to do stuff that you don’t want to do,” Rogers said. It’s a philosophy that she says will carry over into recruiting and scheduling. Rogers, who says she needs to see a recruit play three times before she’ll sign her, knows the type of characteristics she’s looking for when she’s out on the road: tough, competitive, blue-collar, team-oriented; qualities that are familiar. It’ll be a challenge, Rogers knows. But she’s already way ahead of where she was 16 years ago at Indianapolis. Much of the infrastructure to succeed is already in place at VCU. Either way, Rogers has always welcomed a challenge.